A mysterious figure in red… Something’s driven everyone away from Linden Shades. No one’s been back since that time of terror when the kids drew startling images of blood-red ghosts, and the police were no help. Your editor’s sure there’s a story hidden in the Shades. Can you get the truth, off the record? 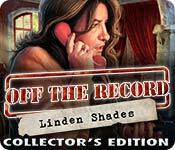 Off the Record: Linden Shades Collector's Edition is rated 4.2 out of 5 by 75. Rated 5 out of 5 by Kimmycoo from Love Real Actors One of my fav things in any game is the use of real actors. Its so hard to find that nowadays. I was always a MYST lover. A game from long ago that used real actors. Its what made the game so great. This game did the same. I love that. They use them during cinematics. I thought this game was fantastic. All "Off the Record" games are excellent. Ive played, beat and loved them all. This one had a great CE surprise with behind the scenes with the game developers. That was really cool. I enjoyed collecting the toys, crayons and letters in this. Though they do nothing after you find them all except to give you an achievement. I loved the whole series of Off the Record. Some of the best games on Bigfish. Rated 5 out of 5 by Majestyx12 from Old Fun on Windows 10 After playing the trial I wanted this game and bought it at the next sale. I'm in it for the Hops and Loved it. I Loved the country scene and home. I like collecting the crayons. The story is good. The graphics are dated but not too bad. It was fun. Big Fish has a lot of fun games old and new. Rated 5 out of 5 by canadiangirl94 from Definitely worth it to get CE It's from the same developers that made the Final Cut series so you get the same awesome quality of game. Love how they use actual people in the cut scenes to help make it a more realistically set game. HO scenes were fairly straight forward, liked how there was an interactive puzzle in each one. CE are sometimes a hit and miss on the bonuses available for them, but this is one where it is worth it to get the CE. You get an extra bonus chapter to play which is set after you've solved the mystery and it gives you some background info on the mystery surrounding Linden Shades. Also it was great being able to see all the cut scenes and listen to the different music clips which suited the locations and HO scenes perfectly. Neat also having photos from the photo shoots for some of the cut scenes and also the little behind the scenes clip. Awesome game. Rated 5 out of 5 by megwoman25 from Review of Completed Game... Eipix is starting to become one of my favorite developers. They really have amazing ideas. This is one of the best storylines I have played in awhile. Yes its the typical person in the ghost suit running around scaring people BUT it is told so well through cassette tapes that I really had no idea who was involved or why. It leaves you completely open and if you really follow along and get into the mood of the game, its pretty creepy what you are doing especially as a woman. 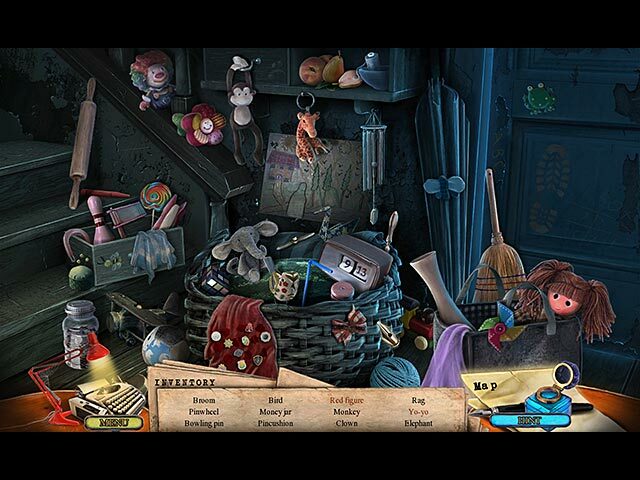 There were a lot of hidden object scenes but until the bonus chapter, you never had to play one more than once. Kudos to that. The puzzles were all very doable if you take the time. Some of the achievements were a little weird like skip 5 puzzles or get through the game without ever opening the map. For the record, I only like to skip puzzles if I can't figure it out even with a strategy guide or if its math lol and I never opened the map but didn't get credit for it! I rounded up to 5 but would probably give this game a 4.5ish rating due to the achievements not registering properly and not being able to achieve them in the bonus game. I had not gotten the 10 hidden objects in 10 seconds or the 3 hidden object scenes without a misclick and thought I could still get them when I went to the bonus but I was wrong. I would have liked it to carry over so I could have gotten them all. However I did find all the collectibles and let me tell you those crayons blended in! The game completely wraps up in the main game and the bonus game was you being called back to find the deed of the house. Its kind of weird that a reporter would be called in as you aren't a detective but you are back. You do revisit the old house but honestly it doesn't look the same and you do go to some new locations too. You also find diary entries in the bonus game that show how the plan was conducted and why and who was involved. A little back story. There are a lot of extras. 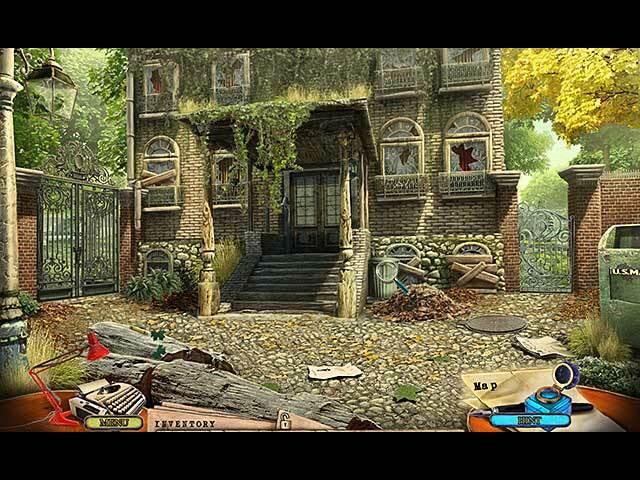 More hidden object scenes to play besides the ones you did. Music/wallpapers/art like usual. It also had all the videos you could watch again and some that I hadn't seen before. I like this developer because they always have a "making of..". This one made me laugh in fact. Love how it shows you some of the live acting and the people who make the game. I thought the live acting was really well done in this game unlike some others. You could also replay puzzles and there's something else but I can't put my finger on it. You also collect 37 crayons, 12 letters and 16 children's toys. The crayons blend in! The letters were pretty obvious but the children's toys are tricky because in the adoption center there are a lot of toys laying around and not all of them are the ones that are collectibles, so you really need to make sure you click everything. This game was not only enjoyable but a bit suspenseful at times. I thoroughly enjoyed playing it and I enjoyed the twists and turns the game takes you on. Eipix really did a good job on this game. I can't wait to see what other games they have in store for us. With creative minds like these, I am sure I will love where they take us from here. Rated 5 out of 5 by mycatluna from A Game That Exceeds All Expectations This game comes from game developer Eipix and I am incredibly impressed with their games; most recently, this wonderful HOPA that I can foresee being a contender for one of the best HOPA games of 2013. Compared against the same old and tired cookie-cutter games that the casual gaming market seems to be flooded with as of late; this game from Eipix stands apart from the rest. I won't go into much detail about the game mechanics as others have already covered that area thoroughly. What I will say is that everything from the opening cut-scene to the final credits (which are hilarious by the way and I recommend reading through them) were done exceptionally well. 5 stars all across the board as far as the game mechanics, voice-overs, storyline, atmosphere and ambiance. The game is bright and colorful while still maintaining a chilling experience and can be enjoyed by a variety of players as it does not delve into the occult; it is a mystery to solve and is extremely well-polished. It is obvious from the start that the developers put a lot of hard work into this game, which, as a player, I really appreciate. There is a perfect balance of adventure, HOS, mini-games and mystery to keep the player entertained and invested. 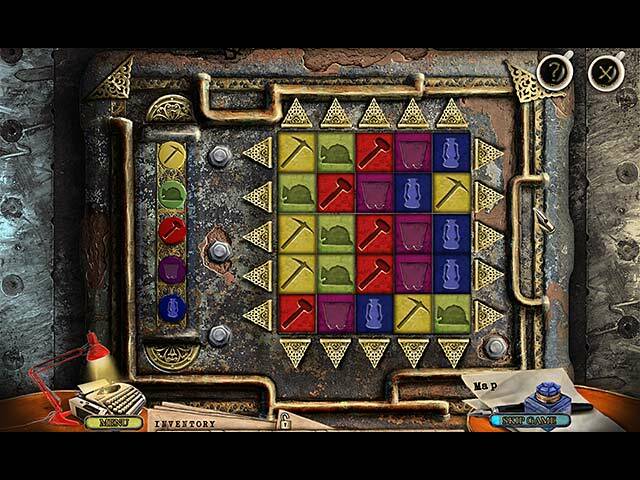 The puzzles were just difficult enough to provide a challenge but not so difficult that players will get frustrated and hit the 'skip' button. All skill levels will most likely find the mini-games and puzzles both fun and solvable. The CE does include 3 different types of collectibles that are very well hidden. I liked the extra challenge of trying to locate all of the collectibles due to the difficulty level of trying to locate some of them. The fact that their locations were not blatantly obvious really increased the fun factor. There are also achievements, an enjoyable bonus game, the usual wallpaper and concept art, a rather enjoyable 'making-of' video and a few other extras that aren't often seen packaged with CE's. Even without the bonus chapter or all of the extras, this game would still be well worth the CE price tag if you are able to afford it. Otherwise, the SE will be just as enjoyable as the game wraps everything up nicely at the end so all players, regardless of game version purchased, can enjoy it which I find admirable on the part of the developers.The length of the game is just right. It's not a short game by any means, nor is it too long to the point where a player may begin to get bored. You will get your money's worth of playing time with this one. I spent at least a solid 6-7 hours on this (roughly 5 hours on just the main game) and consider myself an expert player. I did read the journal, watch all cut-scenes, find all the collectibles, attempted to earn as many achievements as possible, did not skip any dialog, puzzles or HOS, or use the hints or the map. The interactive map that let's you jump from location to location is nice to have, but not really necessary as there is not a lot of backtracking in this game, which means less filler and fluff and more actual game-play, which is also appreciated. I look forward to more games by this developer as they have definitely set the bar high in the HOPA genre. Very well done game. Bravo to those that worked very hard on this enjoyable game; your efforts paid off. I highly recommend this game to players of all skill levels. Rated 5 out of 5 by DrDavid from Highly recommended I will go on the record as recommending this game. The play was fun and the minigames were not as distracting as those of most recent games. Most recent HOGs have lengthy minigames that make one forget where the story was going. These games were mostly short and pretty easy games and I actually played all but two of them. Usually I just skip all minigames as too boring to bother with and then continue with the HOG game. I wish there were more games like this one. Rated 5 out of 5 by JoannC2518 from Fantastic game! I loved, loved, loved this game! It would be worth getting for the superb graphics alone, but it also has an engaging story line that keeps things moving. There is a bit of back and forth, but not so much that you lose sight of your objective and the interactive help allows you to get around easily. Puzzles are fun and fairly easy, and (thankfully!) not the dreadfully dark kind that strain your eyes. Best of all, you finish the regular and bonus games with a smile on your face and feeling good. What more can you ask of a game than that? Only downside for me was the music, which quickly became annoying so I played with the sound off but otherwise the game was terrific and I will be looking for others from these devs. They are top-notch all the way! Rated 5 out of 5 by lizzy0124 from I really enjoyed the demo I downloaded the demo and it looks like I'll be shelling out the money to finish it. Who knows?! I'm a little concerned that I reached the end of the demo version within 25 mins so I hope that's not a precursor to the rest of the game.